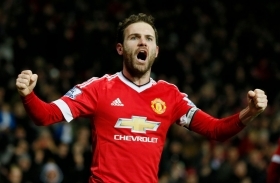 Barcelona looking into Mata deal? Spanish giants Barcelona have reportedly expressed their interest in landing midfielder Juan Mata, who has less than six months remaining on his Manchester United deal. The Spaniard is currently in discussions regarding a new contract with the Red Devils but so far, there has been no breakthrough with regards to an extension. Arsenal have recently been linked with a Bosman move for Mata when his contract expires in the summer but according to Goal.com, they could face competition from the Blaugrana. Ernesto Valverde's side are currently stocked with options in the final third but they are nonetheless looking into a move for Mata, given they may only have to settle a signing-on bonus to recruit him in the summer. Mata has been with United for the past five years but he has not been able to establish himself as a regular starter. He has made just 11 starts during the course of the ongoing campaign.